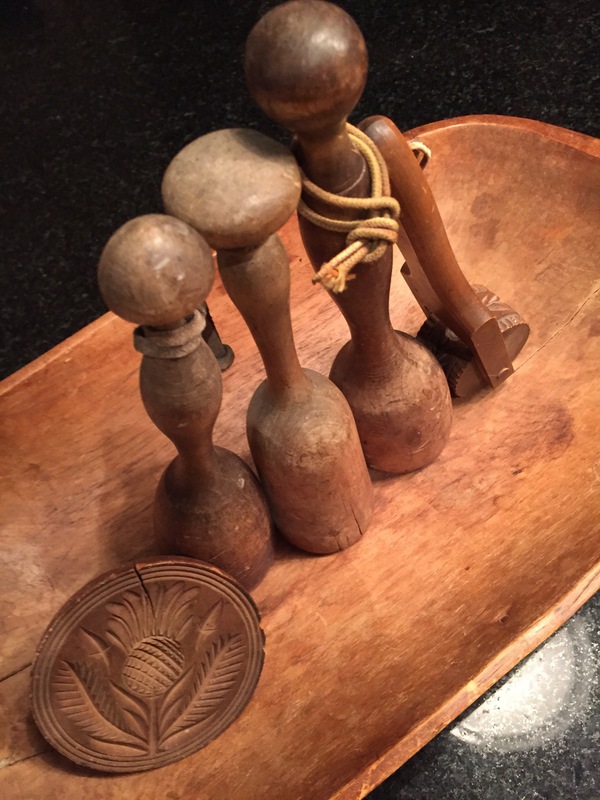 We inherited a lot of interesting stuff from Kish’s Mom, but my favorites are some wooden kitchen implements we keep in an old wooden bowl on our countertop. They are worn smooth, with a warm patina burnished by hands of the past, and they have that evocative, somewhat mysterious element you often sense with older things. I’m not sure exactly how old they are, but I’m guessing they date from the 1800s. With all-wooden construction and touches like leather straps, there certainly isn’t a whiff of mass production about them. And their precise use isn’t entirely clear, either. Sure, there’s a cracked cookie press, and a dough roller that would leave leaf designs on pie crust, but the uses for the three items in the middle are less obvious. They’re built to pound . . . but pound what? Bread dough? Meat? Or something unsuspected that we now buy, pre-made and pre-packaged, at the neighborhood supermarket? The three “pounders” conjure up a long-ago kitchen of hard work, sweat equity, and muscle.